There are so many shots of downtown Seattle that you see that EVERYONE has taken. Everyone has been up to Kerry Park and taken pictures of downtown when the sun is setting. Everyone has stood at the base of the Space Needle and taken pictures looking up. Everyone has taken the picture of the Space Needle with the ferris wheel in the shot. These are great pictures and I'm not knocking them because I have done them too but part of what I want to try to do as I learn photography and composing pictures is to experiment and come up with a different perspective than what you normally see from every joe blow photographer. 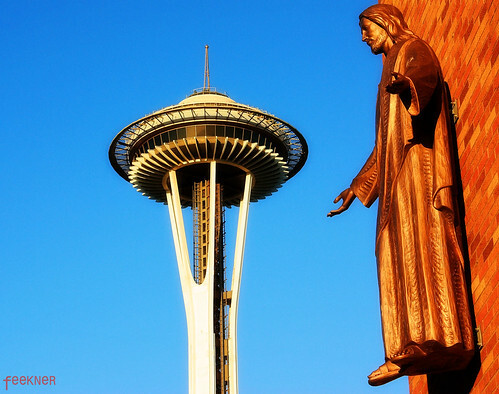 As I went out to do the standard Space Needle/Kerry Park pictures I pushed this idea and came up with the following photo. Faith is something very important to me and I wanted to capture both that and the city I love in a different perspective.